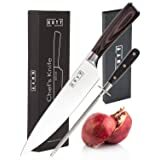 PROFESSIONAL JAPANESE CHEF KNIFE---This chef knife features an ultra sharp Japanese super steel cutting core at 62+ Rockwell hardness: extraordinary performance and perfect grain. Premium high-carbon stainless steel layers ensure exceptional strength, durability and perfectly balanced.. 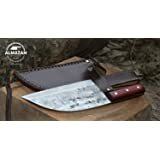 DURABLE & WOOD HANDLE DESIGN---The solid grip wood handle combined with the razor-sharp cutting edge stainless steel blade with its create distinctive design makes sets this knife above the rest and ensures the knife is built to last you a lifetime. 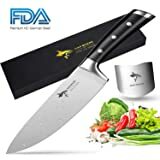 8" blade and 5.5" handle desigh, Much easier to manipulate for different functions.The Most suitable weight 9.31 oz(265g) gives you greater control in the cut..
FDA-APPROVED JAPANESE STAINLESS STEEL ---that resists rust, retains sharpness for longer and lasts for years. 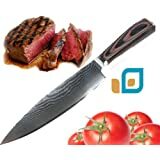 Stop sharpening those knives every few months.Ideal for people who frequently use for cooking.. 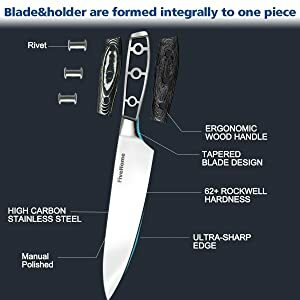 BALANCED ERGONOMIC HANDLE--- This chef knife's handle is curved ,This results in a very sharp edge and means that less force needs to be applied to cut through aliments. The blade joins at the best length to the premium ergonomic handle that can achieve minimize any fatigue, finger numbness or aches after holding it for a long time..
12 MONTH WARRANTY & GIFT PACKAGING--- We're so confident in our product that we offer a no hassle, no questions asked satisfaction guarantee. 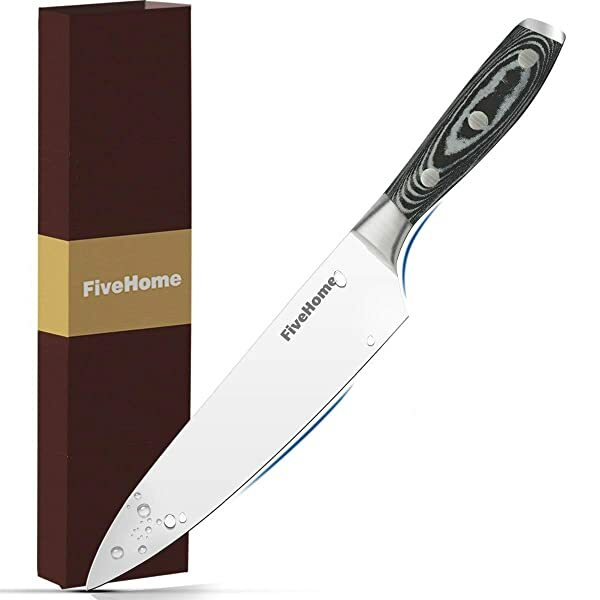 Our chef knife comes in a luxurious packaging that will surely surprise any gift recipient on any occasion. WATCH VIDEO - https://www.youtube.com/watch?v=L-CCKdaP8bw&feature=youtu.be. Made out of safe, durable and quality stainless steel grade that doesn't dull easily, this Kitchen Knife is your ticket to cooking with ease. 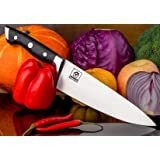 For food preparation at home or in the commercial restaurant kitchen, this 8 inch Chef Knife offers sharp blades and sturdy grip for all of your food preparation needs. 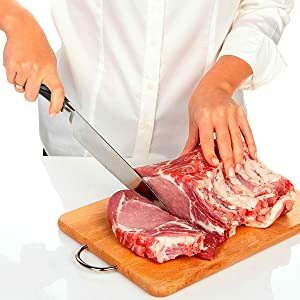 Easy-to-use and durable; this Stainless Steel knife is made with tarnish-free and rust-resistant Stainless Steel that will stay sharp after several uses. Made of high quality Carbon Stainless Steel that maintains its functionality for a long time. Combine the solid grip wood handle with the razor-sharp cutting edge and stainless steel blade to create distinctive designs. Make it a peerless efficiency utility kitchen knife for lifetime use. 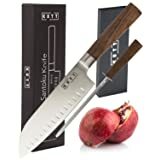 Multipurpose and pratical chef's knife designed for chopping, mincing, slicing, and dicing with razor sharp, laser-tested, tapered knife edge is ground to form an exacting angle, to hold a sharp edge longer and ensures maximum cutting performance and durability to ensure the beauty and taste of the foods. 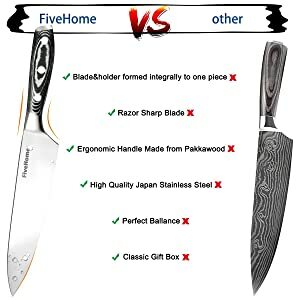 8 blade and 5.5 handle desigh, Much easier to manipulate for different functions such as chopping, mincing, dicing, and slicing as it of a standard size. 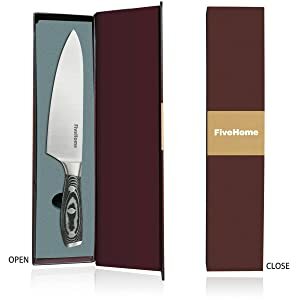 FiveHome chef's knife weighs 9.31 oz(265g).The Most suitable weight gives you greater control in the cut, providing good balance to Enjoy your cooking time. All FiveHome Kitchen and cooking utensils backed by Our Lifetime Warranty and No Questions Asked Return Policy.